Government bond mutual funds are popular among income seeker investors. As part of fixed income fund, government bond fund can reduce risks associated with market volatility. One of the top rated intermediate government bond mutual funds is Vanguard GNMA fund. 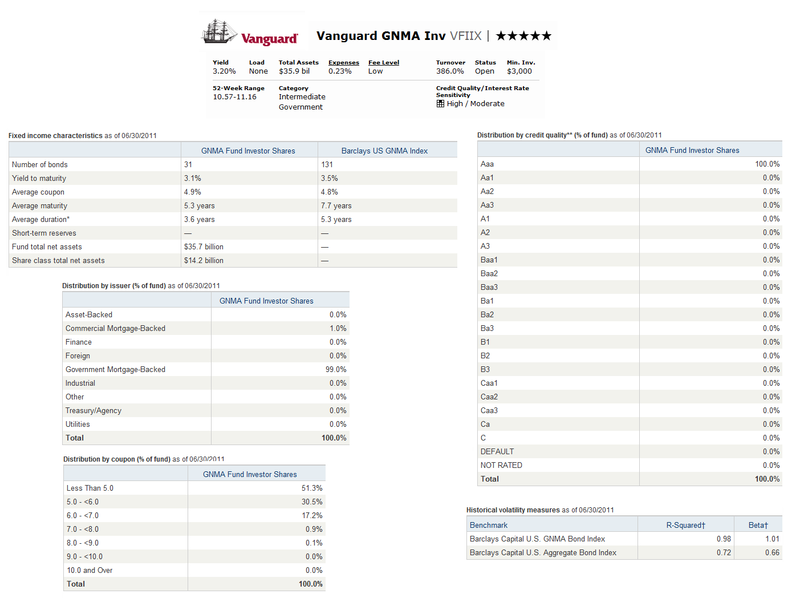 More about this Vanguard fund review can be found below. As one of the actively managed fund, this Vanguard GNMA fund is seeking to provide a moderate level of current income. This Vanguard fund typically invests majority of its assets (>80%) in GNMA pass-through certificates, which are fixed income securities representing part ownership in a pool of mortgage loans supported by the full faith and credit of the U.S. government. It may invest in other types of securities such as U.S. Treasury or other U.S. government agency securities. The fund’s dollar-weighted average maturity depends on homeowner prepayments of the underlying mortgages which normally fall within an intermediate-term range (3 to 10 years). Note: GNMA is also known as Government National Mortgage Association or Ginnie Mae. Michael F. Garrett has managed this Vanguard fund since May 2010. This top rated Vanguard fund was introduced to public on June 1980. The fund advisor of this VFIIX fund is Wellington Management Company. This government mortgage backed bond fund has an expense ratio of 0.23% per year. This figure is lower than the average in the Intermediate Government category (0.99%). The total net asset of this fund is $35.65 billion. It has a yield of 3.22% for the past year. As a no load fund, this best rated fund doesn’t charge any front end sales load or deferred sales load. This intermediate government bond fund has an average duration of 3.6 years. This fund is rated with 5-stars return rating by Morningstar as it has recorded 29 years of positive return since its inception 30 years ago. The best 1-year total return was in year 2000 with 11.22% and the worst was in 1999 with 0.78%. This VFIIX fund has 3.31% YTD return. The other class of this intermediate term government bond fund is VFJIX (Other Class) that has 3.46% yield. The minimum balance to invest in this top rated bond fund is $3,500 for either brokerage account or IRA account. This fund requires $100 for the minimum subsequent investment. This best rated bond fund can be purchased from 86 brokerages, such as JP Morgan, EP Fee Small, T Rowe Price, Schwab Retail, Pershing Fund Center, E Trade Financial, Firstrade, Principal Advantage, etc. 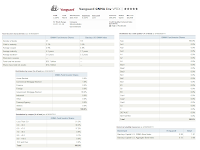 As of June 2011, this Vanguard fund has a total of 31 bonds. The distribution of the assets by issuer is 99.0% in Government Mortgage-Backed and 1.0% in Commercial Mortgage-Backed. The benchmarks of this fund are Barclays Capital U.S. GNMA Bond Index and Barclays Capital U.S. Aggregate Bond Index.